I have a long-standing love of cheesecakes. 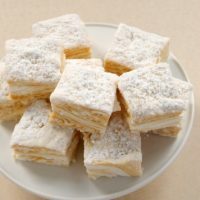 They’re one of my favorite desserts to make and, of course, to eat. 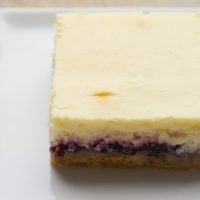 As much as I enjoy baking traditional cheesecakes, I have a bit of a soft spot for the no-bake variety. Maybe it’s their simplicity, or maybe it’s their soft, fluffy texture. Either way, I love to whip up one whenever I need a simple dessert to share or just when I’ve got a craving for one. I’ve made many different kinds of cheesecakes over the years with various flavor twists and such, but this beauty is a reminder that sometimes the simple things are all you need. And it doesn’t get much simpler in the dessert world than vanilla and chocolate. By simple, I certainly don’t mean to imply a lack of flavor. On the contrary, vanilla is a fantastic flavor all on its own! 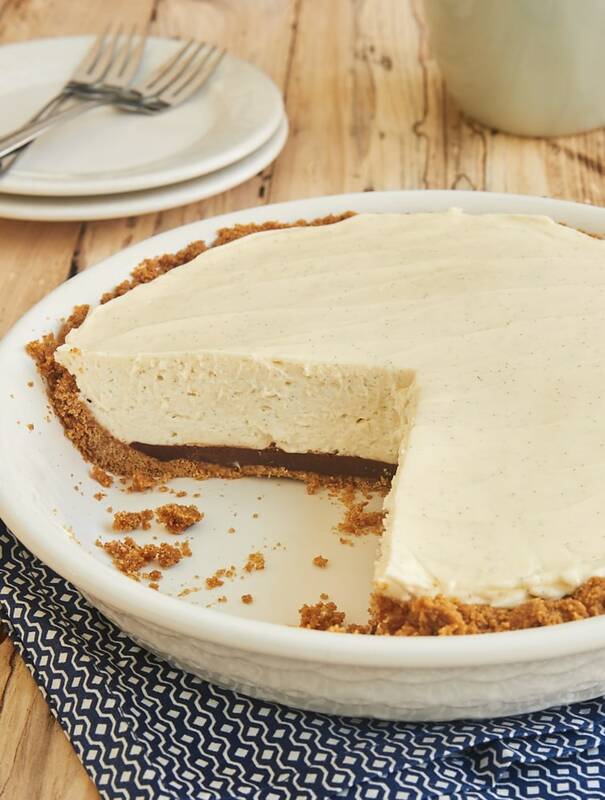 While vanilla extract is a must in my pantry for just about everything I bake, this cheesecake utilizes vanilla in a bigger way with vanilla beans. The flavor is fantastic, and those little specks are just so pretty! You’ll need the seeds of one to two vanilla beans for this cheesecake. As an alternative, I highly recommend vanilla bean paste. It is a thick liquid with vanilla beans suspended in it. 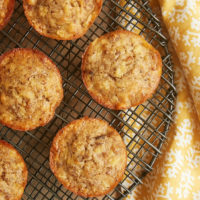 It’s a great option to keep in your pantry for using in place of vanilla beans. If you don’t have access to either beans or the paste, then vanilla extract will work, too, for the flavor if not for the flecked appearance. 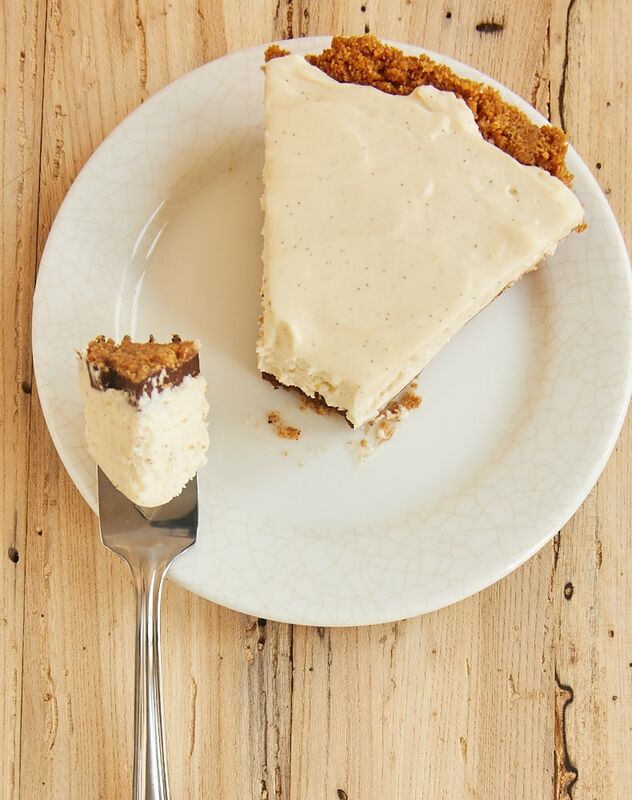 If you like, all that vanilla cheesecake filling is perfectly delicious all on its own in a cookie crumb pie crust. But I think I love it best with a layer of simple dark chocolate ganache between the crust and the filling. It adds a bit more flavor while still keeping this cheesecake super simple. 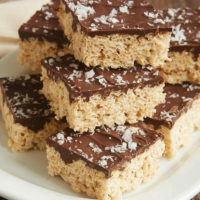 The no-bake in the title of the recipe comes with an asterisk. The cookie crumb crust doesn’t have to be baked, but I find that it holds up a bit better if it has just a little oven time. 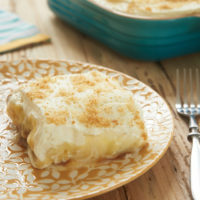 For a truly no-bake experience, chill the pie crust for about half an hour before filling it to help it become firmer. 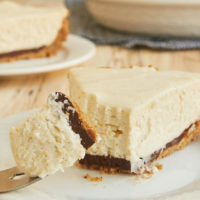 I just love this simple cheesecake. The wonderful flavor, the ease of preparation, that little chocolate surprise inside…. They all make it irresistible! 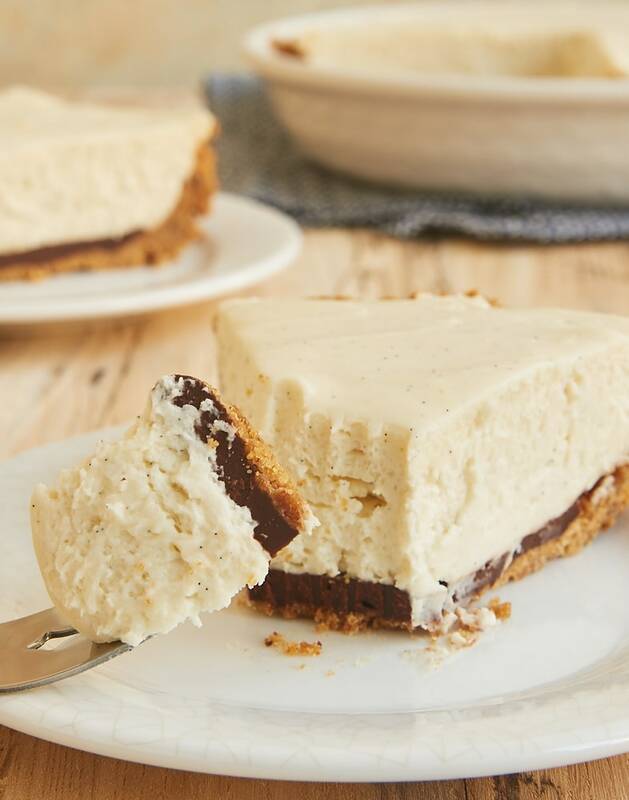 Black Bottom Vanilla Bean Cheesecake is a celebration of vanilla with a little chocolate surprise! Preheat oven to 350°F. * Lightly grease a 9-inch pie or tart pan. 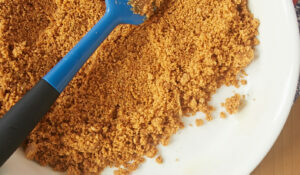 Combine the cookie crumbs and butter until thoroughly mixed. Press into the bottom and up the sides of the prepared pan. Bake 12 minutes. Set aside to cool. Place the chocolate and cream in a microwave-safe bowl. Heat in the microwave at half power in 30-second increments until the chocolate melts when stirred. Stir until smooth. Spread the ganache evenly in the bottom of the crust. Chill for about an hour. 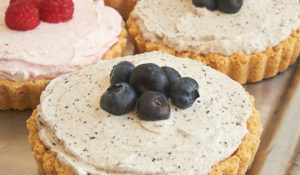 Using an electric mixer on medium speed, beat the cream cheese, sugar, and vanilla seeds (or paste or extract) until thoroughly combined and smooth. In a separate bowl, use an electric mixer with a whisk attachment to whip the cream on high until soft peaks form. Fold about 1/3 of the whipped cream into the cream cheese mixture. Then gently fold in the remaining whipped cream. Spread the filling evenly in the pie pan. Refrigerate at least 4 hours before serving. 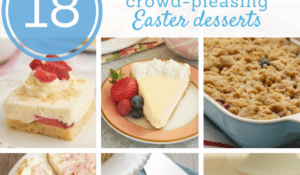 *I prefer to bake cookie crusts briefly to make them a bit firmer and sturdier. If you want to skip the oven time, simply chill the crust in the pie pan for about half an hour before filling. I❤️seeing those little specks of vanilla bean in that cheesecake! 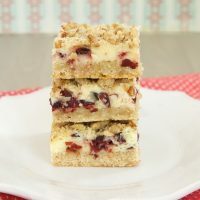 This sounds absolutely amazing…I’ll just have to find someone to share it with since my husband doesn’t eat cheesecake! It looks soooo good and delicious! Great recipe I really must try soon. 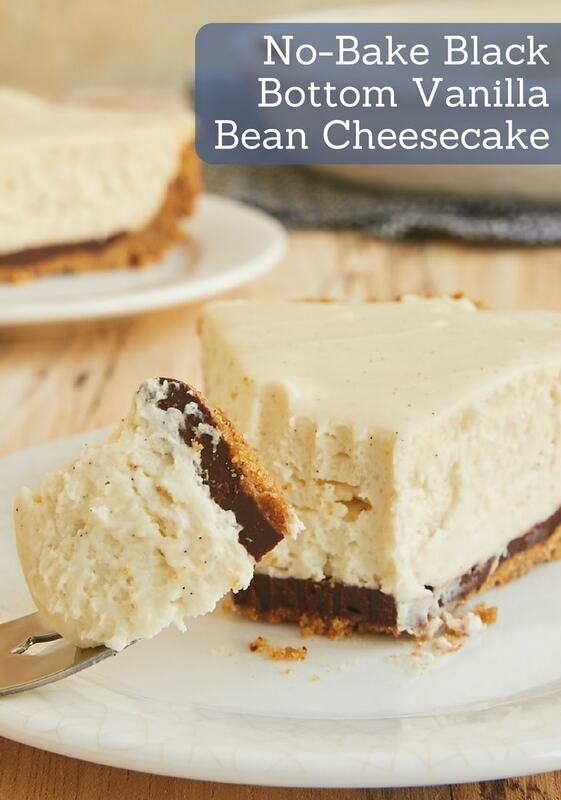 The filling looks so so thick and creamy, especially for a no bake cheesecake. Yum! Beautiful, sweet, comforting, yummy. I’m in. Thank you and have a pleasant day ! Took me a while to get round to making this one….. but today was the day, Valentines Day. DELICIOUS. My wife loved it, I even used a heart shaped mould. Didn’t bake the crust, but it held together fine whilst spreading the ganache. I whipped the cream then mix whipped together the cheese and sugar to avoid cleaning the whisk between mixes. I did it by hand, I don’t have a mixer. No problem at all and it is easily made by hand. I’m glad to hear it was a hit! Sounds great! However, I’m new to baking and was unsure about the “folding” part of the instructions with the cream mixture? Folding is a gentle way of mixing that you’ll usually see when adding something delicate like whipped cream. Too much mixing will cause the whipped cream to deflate. I like to add a bit of the whipped cream (maybe 1/4 of it) to the other batter and mix it fairly well. Then add the remaining whipped cream and use more of a folding motion than stirring to incorporate it. You should be able to do that with just a handful of turns. Made this last night and took it to a friend’s house for tea tonight. We don’t have Graham Crackers in NZ, so my go to are Digestive Biscuits, and I don’t bake the base. Love the idea of the ganache layer on the base. I would add more vanilla – maybe another teaspoon of paste – when I make it again. It went down well! Thanks for a simple and delicious cheesecake recipe. 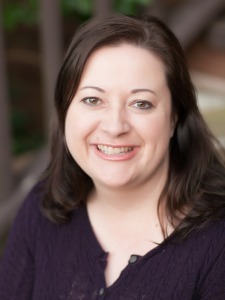 I’m glad you liked it, Karyn!